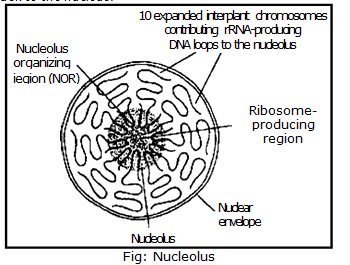 Nuclear envelope encloses the nucleus. 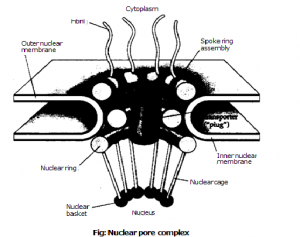 So it separates nuclear contents from the cytoplasm. It is continuous with the ER at number of points. and meiosis. The lamina acts as a site for the attachment for chromosomes. During prophase in mitosis. the chromatids condense to form chromosomes and nuclear envelope disintegrates. During metaphase, the nuclear envelope is completely disintegrated. ‘Hie nuclear envelope is perlbrated by pores. The whole pore complex has a diameter of about I 50mn, and the diameter of the opening is about 50 nm wide. 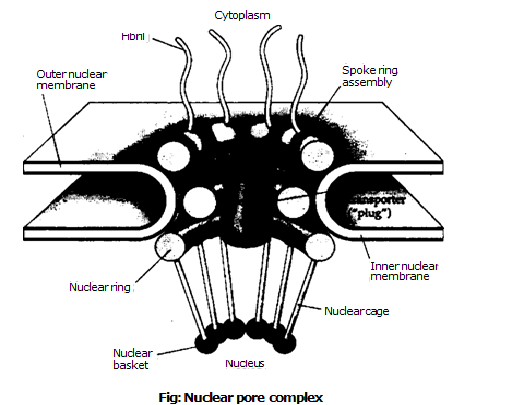 There are about 3.000-4,000 nuclear pore complexes in the nuclear envelope of an animal cell. The pore complex regulates the movement of macromolecules and particles. These pores give the nucleus direct contact with the ER. The size of pores prevents the DNA from leaving. But it allows RNA and proteins to move out. Nuclear pores allow the transport of water-soluble molecules across the nuclear envelope. This transport includes RNA and ribosomes. 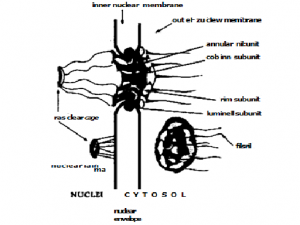 .1hey move from nucleus to the cytoplasm. Proteins (DNA polymerase). carbohydrates. signal molecules and lipids also move into the nucleus. ma I ler molecules simply diffuse through the pores. But larger molecules are recognized by specific signal sequences and then they are diffused with the help of nucleoporins into or out of the nucleus. This is known as RAN cycle. I. I mportins (carrier) are imolyed in the transport of protein with an NTS into the nucleus. Importin-u binds first to the NTS sequence. It acts as a bridge for the attachment of Importin-p. The complex importinh-importinu-complex is then directed towards the nuclear pore and diffuses through it. RanGTP binds to !moot–tin-13 in nucleus and displaces it from the complex. Then CAS (Cellular Apoptosis Susceptibility) protein displaces Importin-u. The NTS-protein is thus free in the nucleoplasm. I. Proteins which are to be exported contain NES (Nuclear Export Sequence). It binds with an exportin and RanGTP in the nucleus. Thus a heterotrimeric complex is formed. 2. The complex is then diffused into the cytoplasm where GTP is hydrolysed and the NES-protein is released. RanGDP diffuses back to the nucleus.